Researchers pictured at the launch in Cobh today. A LARGE-SCALE exploration of the Atlantic Ocean was launched in Cobh, Co Cork today. 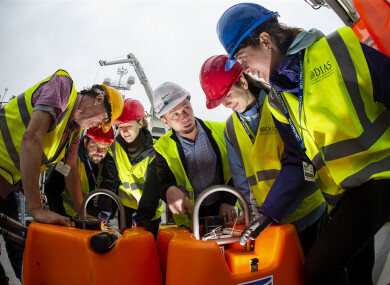 The SEA-SEIS project is one of the largest deep-ocean research projects ever undertaken in Europe. It will deploy 18 state-of-the-art seismometers to measure movement at the floor of the Atlantic Ocean, hundreds of kilometres off the coast of Ireland. The network will cover the entire Irish offshore area, with several sensors also being placed in British and Icelandic waters. The seismometers will be in place for the next two years. The equipment will be deployed on a mission on the RV Celtic Explorer over the next three weeks, with the ship returning to dock in Galway on 7 October. DIAS and other collaborators confirmed in the late 1980s that Ireland has an ocean territory 10 times larger than its terrestrial landmass. Lead researcher Dr Sergei Lebedev, from DIAS, added that Ireland is “uniquely suited to this type of deep-sea science, as 90% of the Irish territory is offshore, most of it to the west of Ireland”. “The ocean-bottom sensors will record the tiny vibrations of the Earth caused by seismic waves, generated by earthquakes and by the ocean waves. As the waves propagate through the Earth’s interior on their way to the seismic stations, they accumulate information on the structure of the Earth that they encounter. Email “How Irish researchers will explore Atlantic Ocean over next two years”. Feedback on “How Irish researchers will explore Atlantic Ocean over next two years”.